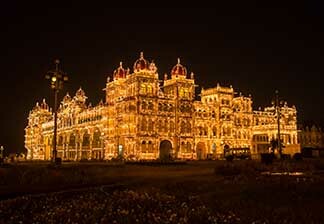 Mysore Zoo is one of the oldest and the most popular in the country. St. Philomena's Church in the city is an architectural marvel. It is designed after Cologne Cathedral in Germany and promises one the serenity one longs for. Brindavana Gardens, an indispensable part of Mysore tourist attractions, are a 45 minute drive from the main city. They represent characteristic Mughal style. The highlights of the gardens include a children’s park, a fisheries station and a hydraulic research station. Karanji Lake is home to more than 5 dozen species of local and migratory birds. It has a giant aviary, possibly the largest in the entire country. Visitors walk through it to observe the birds closely.